The Canadian Indigenous youth leadership program “Preparing our Home” program was announced as a winner of a global competition! The Líl̓wat Nation’s Xet̓ólacw Community School in British Columbia, Canada is working to understand hazards in their own community and develop a school curriculum by integrating Traditional Knowledge, Indigenous Science, Western Science and Technology for increasing community resilience. “The winners of the Global Competition for Youth led projects on Floods and Droughts were announced at the Youth Forum for the Global Platform on Disaster Risk Reduction on the 22nd of May in Cancun, Mexico. The competition was designed to showcase the practical examples and cases on how an integrated approach to flood and drought risk management has been advanced in practice by or through the involvement of youth under the following three themes 1) Understanding risk, 2) Early warning system development, and 3) risk management and planning. 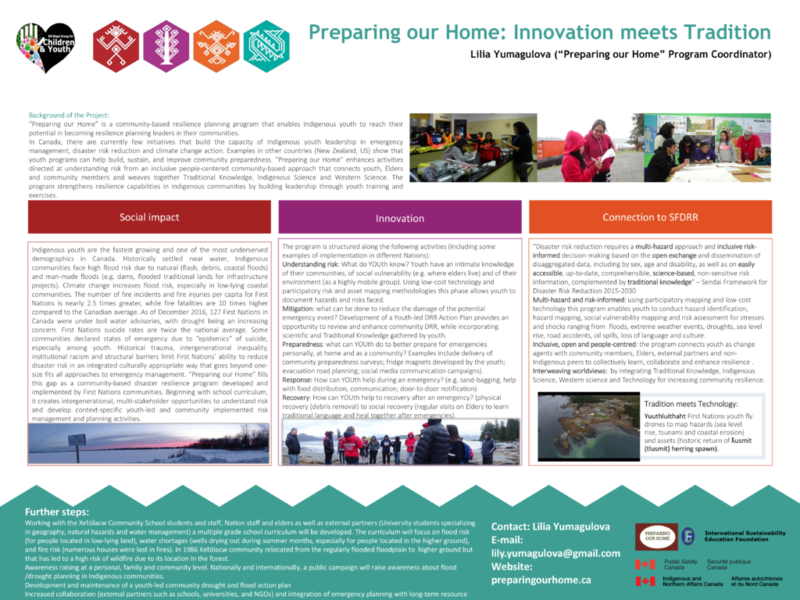 “Preparing our Home” is a community-based disaster resilience program developed and implemented by Canada’s First Nations communities. Beginning with developing multiple grade school curriculum, it creates intergenerational, multi-stakeholder opportunities to understand risk and develop context-specific youth-led and community implemented risk management and planning activities. Training activities in their project implementation pipeline, focus on understanding risk, developing flood and drought resilience strategies, and developing emergency management plans and preparedness planning. See their video here. We are deeply honoured to be recognized globally and we look forward to working on developing the very first Indigenous resilience curriculum for Líl̓wat Nation’s Xet̓ólacw Community School. We are excited about this opportunity for Lil’wat youth to be a global role model. The Youth Network particularly hopes to be able to help share leanings of the program with Indigenous communities world-wide. Many thanks to everyone who contributed, including but not limited to Kelsey Nelson, Alex Douglas, Johnny Thomas, Malcolm Smith, Eunice Smith, Julz Anthony, Luke Johnny, Dakota Flynn, Sandy Henry, Casey Gabriel and Rosa Andrew Principal, Xet̓ólacw Community School for their work. A very special thank you to our Advisory Council for their mentorship for this program. Learn more about the competition: read more. Learn more about Sendai Framework for Disaster Risk Reduction.